Basic Chromium Sulphate Leather Tanning Agent Suppliers, Basic Chromium Sulphate Leather Tanning Agent Manufacturers. Uses : Tanning of all kinds of leathers and furs. 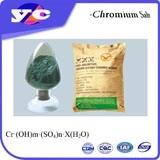 Product description: Basic chrome sulfate Other names: chromium sulfate basic, chromium hydroxide sulfate Appearance: dark green powder with high tanning properties Molecular Formula: Cr•(OH)m•(SO4)n•X(H2O) Basic Chrome Sulfate is available in dark green powder with high tanning properties. It dissovles easily in water and is mainly used in the tanning of various leathers and furs.